Domestic & Commercial Window Cleaning Barking and Dagenham RM | Quality Property Care Ltd.
Conservatories and conservatory rooftops also. 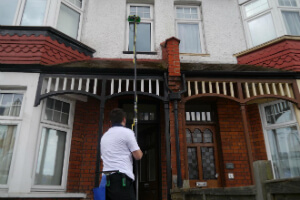 The expert services delivered by Quality Property Care Ltd. are certified and authorised by a number of institutions and agencies, and are suggested both as a commercial window cleaning service and a domestic windows cleaning service. 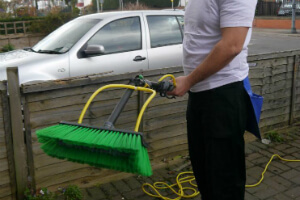 The windows on all kind of domestic properties and commercial properties can be cleaned, as long as they are accessible. For higher floors the firm will provide a well-equipped and experienced rope access window cleaning crew.You can get sticker removal in addition. The only demand for the windows cleaning with the assist of the water fed pole, is that there is an available parking place for the firm's van at a distance of less than 30 meters from the windows. The purpose is that the container with filtered water is in the van, and it is where the water is pumped out of. To accomplish our well-known final results we apply a simple water-purification method which strips away regular tap water from its minerals. This simply leaves it a simple H2O molecule which is a lot lighter and sticks a lot more to mud, dirt and grime. The approach is a very useful way of cleaning away even the filthiest of window surfaces and can reach up to 4 stories in height. Using a telescopic water-fed pole we clean the window sills and windows from the top to bottom using only water, no detergents as detergent attract even more dirt if not rinsed with water. In addition detergents may have corrosive properties on PVC surfaces and cause the gasket and seals of the windows to rot and decay faster. The size of the water fed pole allows us to clean commercial buildings without having to use a ladder or ropes. Rope systems are accessible for commercial clients, contact us at 020 3746 4287 for more information. Quality Property Care Ltd. company performs in the whole Great London region, cleaning commercial and domestic homes inside and out. Our method is capable of cleaning even the filthiest of windows. We work with single and double windows, and quite more. We also clean frames and sills, only if they are PVC, we do no move or repair something. Book Quality Property Care Ltd. Window Cleaning. Call for Special Prices! To reserve us give 020 3746 4287 a call where a team of specialists is waiting to assist you anyway they can. Contact us totally free at the given number to get solutions to questions and book the best cleaning service in London.